When he received the first installment of the reconstruction grant in September, Jhamka Bahadur Thapa planned on moving into a new, warm house before winter arrived.He, his wife, and four-year-old daughter have been living in a makeshift shelter of corrugated metal sheets since the April 2015 earthquake. His daughter often sneezes from frequent colds, made worse by the damp that seeps through the roof and soaks all their belongings. Although Thapa had already stockpiled wood and stones, and took out a loan at an exorbitant rate, he couldn't begin building last fall – and still cannot begin now. Why? Because no masons trained in earthquake-resistant building are available. Almost every one of the 34,256 Sindhuli-district households whose homes were destroyed by the earthquake wants to start rebuilding. But they, too, are waiting for masons and other laborers. Some have lost hope and started rebuilding with untrained bricklayers, even though this means their new houses may be unsafe. 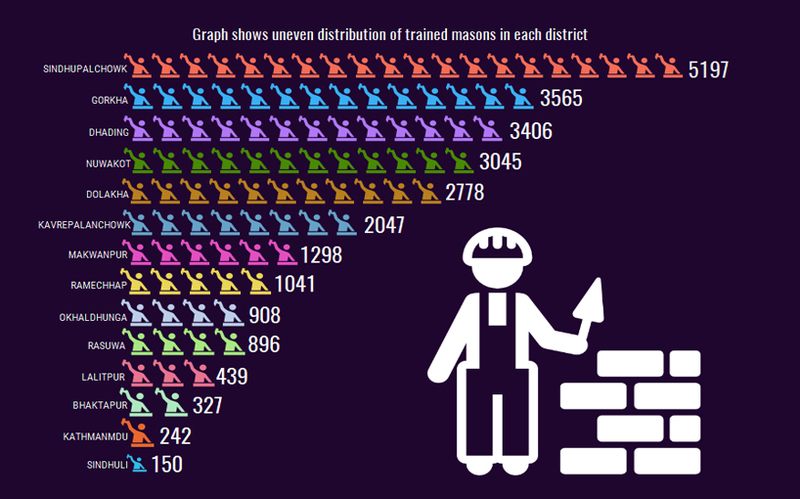 As of December 25, only 150 trained masons were working in Sindhuli district. Masons interviewed said a team of four masons is needed to build one house, and that each team could only construct three to seven houses a year. At that rate, it would take at least 130 years to rebuild all 34,256 houses in Sindhuli. Reconstruction of individual houses will be slowest in Sindhuli amongst all the 14 earthquake-damaged districts. But Sindhuli is not alone in facing a shortage of trained masons. "More than 1,100 households in Sindhukot village, Sindhupalchowk, want to rebuild their houses now, but scarcely 50 masons are available”" said Madhusudan Sigdel, a local leader of Nepali Congress in Melamchi Municipality. 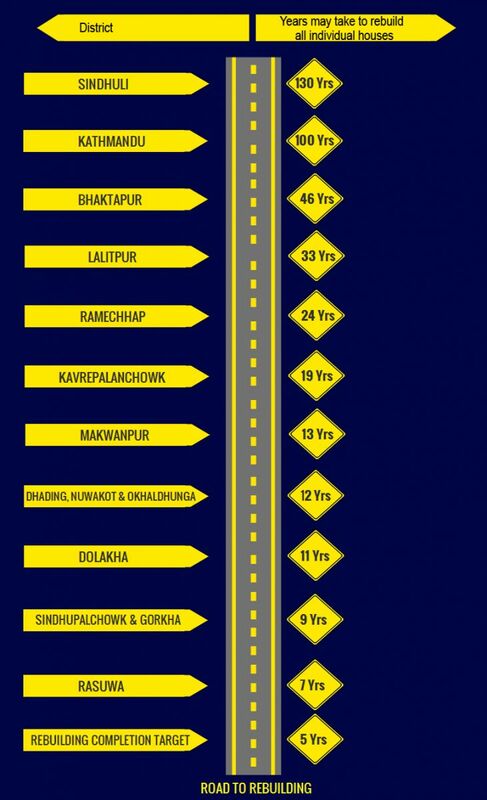 Similarly, building quake-safe houses may take at least 100 years in Kathmandu, which has only 242 trained masons to rebuild 42,500 quake-damaged houses. 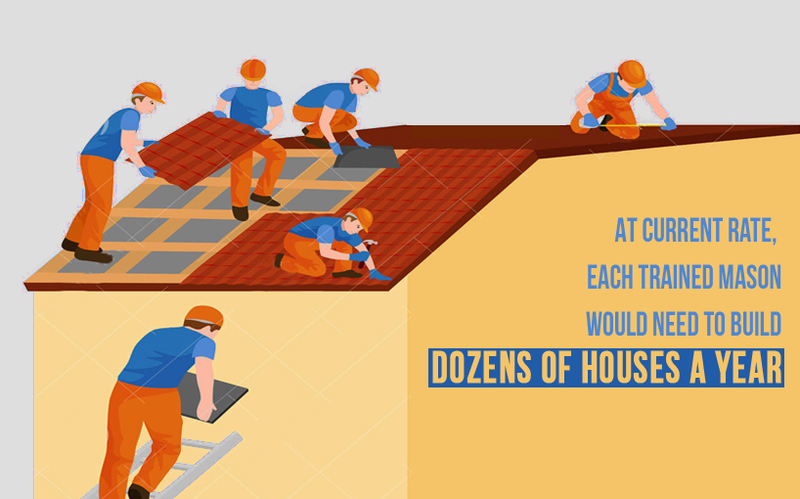 Do the math: Available manpower can only build 423 houses in a year in Kathmandu. Government officials acknowledge the need for more mason training programs but say they have not set aside enough money to fund them. Forty-seven NGOs and INGOs organized training courses for masons to learn building techniques to make houses more resistant to earthquake damage. In all, 25,393 masons have so far been trained since NGOs and INGOs started training in January 2016, according to the latest statistics, compiled in December 2016. The trainings were divided into two types: short, seven-day courses for traditional masons to update them on new techniques; and a 50-day vocational course for 4,359 novices, according to figures compiled by Housing Recovery and Reconstruction Platform (HRRP) Nepal, which coordinates NGO and INGO training programs. The training used a learning-by-doing method, during which the masons built real houses. Data analysis shows that mason trainings have not been distributed throughout the 14 districts in proportionality to the damages suffered in each district. In Sindhuli, for instance, 150 masons underwent training, to rebuild the 34,256 destroyed houses in the district. But in Sinhupalchok, 5,197 masons were trained, to rebuild 78,537 houses, according to National Reconstruction Authority (NRA), the central agency for reconstruction. That means Sindhupalchowk, in the north of Nepal bordering Tibet, trained 34 times more masons that Sindhuli, in the south bordering India, to build only twice as many houses. Chandra Bahadur Shrestha, an NRA executive committee member, acknowledged the yawning gap in manpower needed to rebuild. "We had planned for training of 30,000 masons before housing reconstruction grants were distributed, but the Ministry of Finance took it lightly and we are yet to get the budget of Rs 2 billion for the purpose," said Shrestha. "The training is important for safe rebuilding but it was not taken seriously," he lamented. But Ministry of Finance (MoF) officials however do not agree with Shrestha's statement. Secretary at MoF Shanta Raj Subedi said, "Budget is not an issue, as NRA has enough budget of total Rs 174 billion for the current fiscal year and NRA also can restructure if necessary while spending," said Subedi adding that NRA has got needful budget allocation including for masons training. NRA officials had initially tried to monitor and regulate all NGOs and INGO activities including training programs in the districts, but it received huge criticism from civil society for its delayed response. Despite no less quake damage, Sindhuli and Makawanpur have got less in emergency relief packages and also less exposure to NGOs and INGOs in receiving reconstruction activity in that district," said Binaya Bogati, Information Management Officer at HRRP-Nepal. 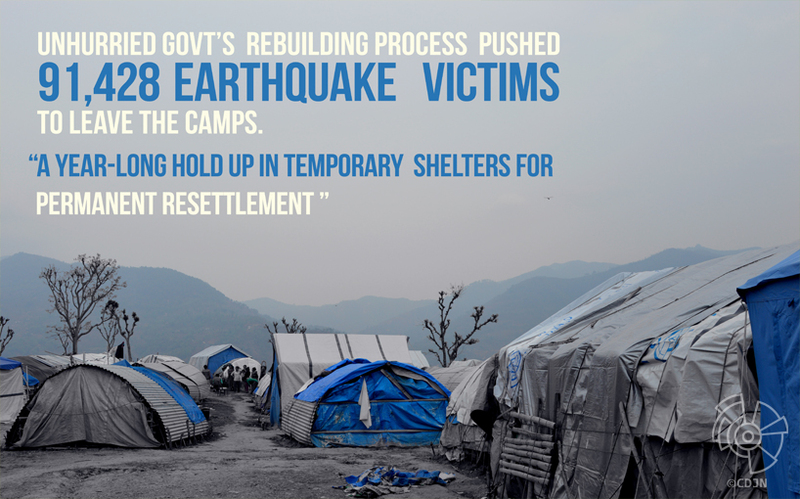 Meanwhile, the government has set a goal of rebuilding earthquake victims' houses in five years. 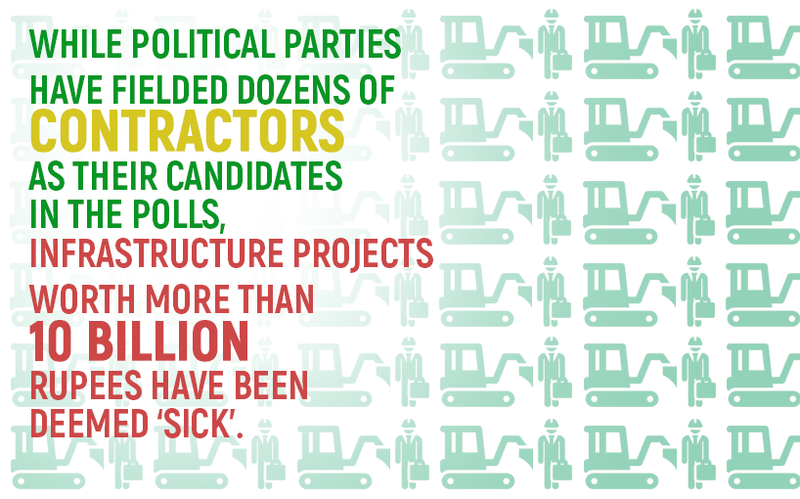 Yet the government has yet to come up with an intensive program to train the manpower needed for reconstruction. Likewise, NRA has separately asked JICA, Helvetas, India and USAID for organizing trainings for another 30,000 allocating area specifics but this has yet to materialize. Shiva Hari Sharma, project director of NRA's Central Level Project Implementation Unit, said that government planned to train a total of 30,000 masons but does not have the budget to do so. "Initially we are going to start the training in Nuwakot, Dolakha and Dhading with a fund received from the World Bank” he said. A total of 150 people, including 60 traditional masons, were trained in safe rebuilding techniques in the Sheetalpati VDC, Sindhuli, but only about 100 are still working as masons. "Others have gone to work as laborers in brick kilns in the capital city, while others have returned to their previous jobs," said Hasta Raj Thapa, chairman of Sheetalpati-based sub-branch of NRCS, Sindhuili. He added, "Those who went to brick kilns had already received advance remuneration for labor work in July. 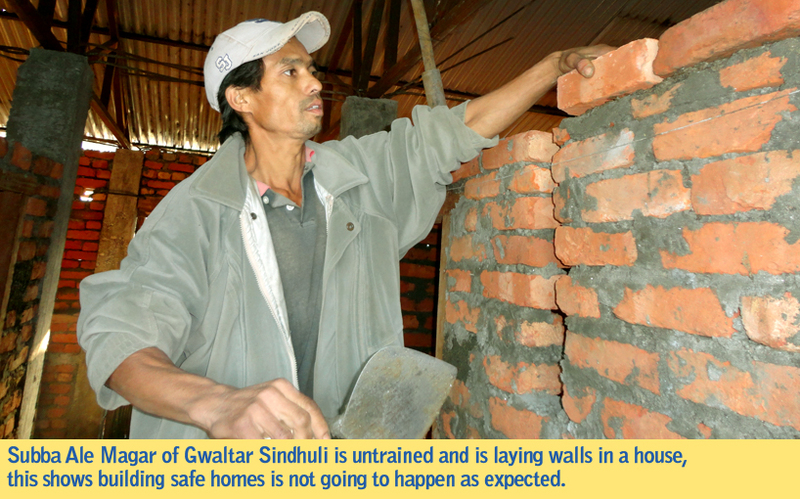 At the same time, masons with no earthquake training can be found rebuilding homes in Sindhuli. Several untrained masons said in interviews that they would love to go to training sessions. But the amount of trainings for Sindhuli was very limited. For instance, Subba Ale Magar, a mason by family tradition, has been working on a concrete house in his neighborhood of Bhuwaneshwary VDC in Sindhuli but never received earthquake training. "I have received several job offers to rebuild houses and I wish I could have been trained," said Magar, who is in his early 30s. Saroj Pokhrel, the owner of house currently under construction by Magar, said that he had to choose Magar because he could not find any trained masons. Netra Bahadur Gajmer, another untrained mason, is also rebuilding one concrete house in Sheetalpati and has finished another house. Experts say government's housing grants were planned as incentives for residents to build safer houses. If the residents go ahead and hire untrained masons, not only do they risk building an unsafe house – they may lose their eligibility for the second and third tranches of the housing grants. Although NRCS monitors rebuilding, Kishor Thapa, an engineer and former government secretary, said enforcing laws such as building codes is very difficult in Nepal. 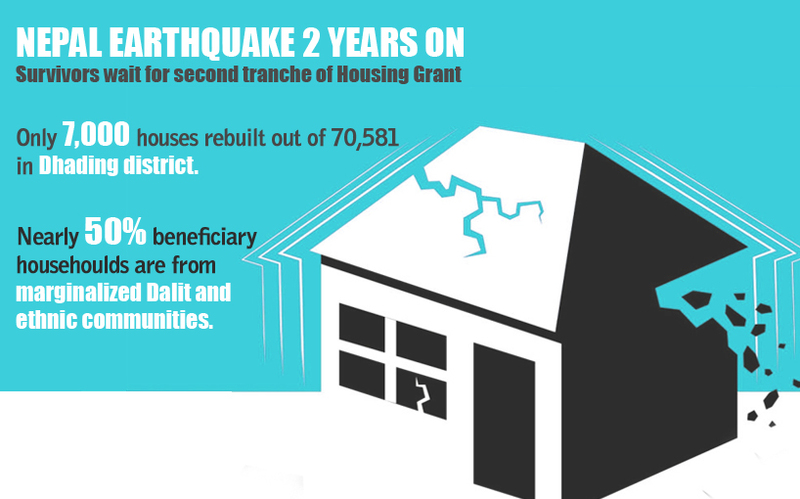 "Housing grants were incentives to ensure building safe houses — those not abiding by code weren't supposed get a second tranche," said Thapa, who was a key member in drafting reconstruction policy. 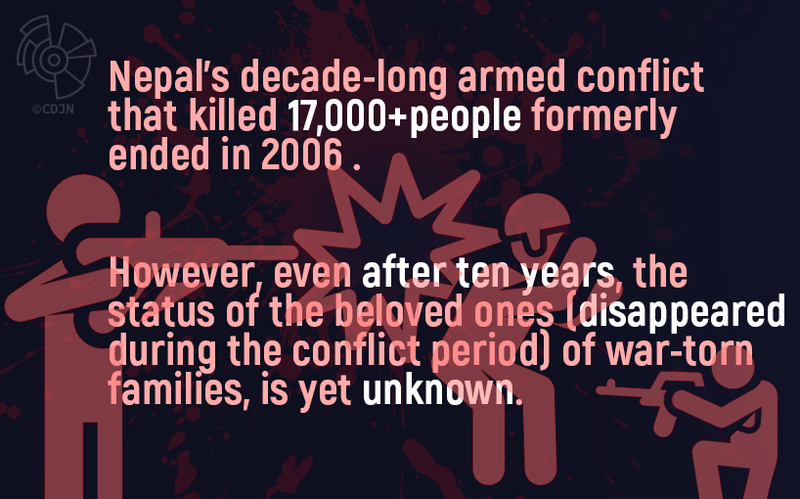 Note: In this story, Center for Data Journalism Nepal (CDJN) has facilitated during data visualization, creating infographics, video and multimedia production. The reporting project is supported by a grant from the Fund for Investigative Journalism in Washington, D.C, and is coordinated by the Centre for Investigative Journalism-Nepal and Lucinda Fleeson, an American journalist and Fulbright Specialist.